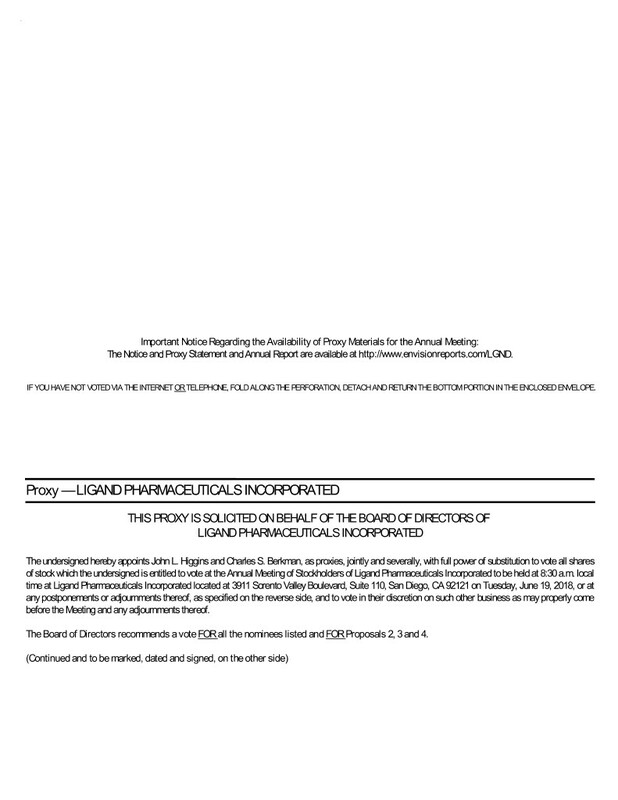 We are writing to notify you of important information about the 2018 annual meeting of stockholders of Ligand Pharmaceuticals Incorporated (the “Company”). We previously filed and made available to our stockholders our proxy statement and related proxy materials on May 1, 2018 (the “Proxy Statement”), which contained three proposals. The enclosed supplementary proxy material (the “Supplement”) is being sent to you because we have determined to (i) add a new Proposal 4 to the original Proxy Statement in order to approve an amendment to our Amended and Restated Certificate of Incorporation, as amended, to increase the number of authorized shares of our common stock from 33,333,333 to 60,000,000 shares, and (ii) postpone the 2018 annual meeting of stockholders, which was originally scheduled for June 14, 2018, to June 19, 2018 in order to provide additional time for stockholders to review the additional proposal and cast their vote. Accordingly, we are furnishing to you, together with this letter, an Amended Notice of the 2018 Annual Meeting and the Supplement to the previously furnished Proxy Statement, which reflect the revised agenda for the annual meeting and describe the new proposal to be voted on at the annual meeting, as well as a new proxy card for purposes of casting your vote on all of the proposals to be voted on at the annual meeting. The annual meeting will now be held at 8:30 a.m., local time, on June 19, 2018 at our corporate headquarters, which are located at 3911 Sorrento Valley Boulevard, Suite 110, San Diego, CA 92121. Please read the Proxy Statement and the Supplement in their entirety as together they contain all of the information that is important to your decisions in voting at the annual meeting. When you have finished reading the Proxy Statement and Supplement, please promptly submit your proxy by completing the enclosed new proxy card in its entirety, signing, dating and returning it in the enclosed envelope (or following the instructions to vote by Internet or telephone). We encourage you to submit your proxy so that your shares will be represented and voted at the meeting, whether or not you can attend. The enclosed new proxy card permits you to submit your proxy for all four of the proposals included in the Proxy Statement and the Supplement, and will replace any previously submitted proxy in connection with the annual meeting. If you have already submitted your proxy and do not submit a new proxy, your previously submitted proxy will be voted at the annual meeting with respect to all other proposals; however, the Company strongly encourages you to submit a new proxy so that your vote will be considered on Proposal 4. To consider and vote upon, on an advisory basis, the compensation of our named executive officers as disclosed in this proxy statement pursuant to the compensation disclosure rules of the Securities and Exchange Commission (the “SEC”). To approve an amendment (the “Amendment”) to our Amended and Restated Certificate of Incorporation, as amended, to increase the number of authorized shares of our common stock from 33,333,333 to 60,000,000. 5. To transact such other business as may properly come before the meeting or any adjournment(s) thereof. The preceding items of business were described in our original Proxy Statement dated May 1, 2018 (the “Proxy Statement”), with the exception of Proposal 4, which is described in the attached supplement (the “Supplement”) to the Proxy Statement. Stockholders of record at the close of business on April 20, 2018 will be entitled to vote at the annual meeting. Each of the foregoing items of business is more fully described in the Proxy Statement and Supplement, which accompany this Amended Notice or have been previously furnished to you. The enclosed Supplement describes new Proposal 4 and includes a revised proxy card which covers the three proposals included in the Proxy Statement and adds the new Proposal 4. If you wish to vote on this new Proposal 4, you must sign, date and return the enclosed proxy card (or follow the instructions to vote by Internet or telephone). Signing and submitting this new proxy card will revoke any prior proxy in its entirety. Therefore, if you submit the new proxy card (or vote by Internet or telephone), in addition to voting on Proposal 4, you must mark the new proxy card in the appropriate place (or follow the instructions to vote by Internet or telephone) to indicate your vote on Proposals 1, 2 and 3. Our stockholders have previously received a Notice of Internet Availability of Proxy Materials, which provided instructions for accessing the proxy materials, but did not receive printed copies of the proxy materials unless they requested them, as we previously elected to use the internet as our primary means of providing our proxy materials to stockholders. We have elected to provide access to the Supplement, this Amended Notice and a proxy card reflecting all four proposals to be voted on at the annual meeting, both by mailing to you a full set of these supplemental materials, and also by notifying you of the availability on the internet of all of our proxy materials, including these supplemental materials and the Proxy Statement and our annual report for the year ended December 31, 2017. The stock transfer books of the Company will remain open between the record date, April 20, 2018, and the date of the meeting. A list of stockholders entitled to vote at the annual meeting will be available for inspection at the offices of the Company and at the meeting. Whether or not you plan to attend the annual meeting in person, please sign, date and return the enclosed proxy card (or follow the instructions to vote by Internet or telephone). If you attend the annual meeting and vote by ballot, your proxy will be revoked automatically and only your vote at the annual meeting will be counted. The prompt return of your proxy will assist us in preparing for the annual meeting. This Supplement describes new Proposal 4, which is added to the agenda for the annual meeting and therefore is not described in the original Proxy Statement. Information about Proposals 1, 2 and 3, each of which will also be presented to stockholders at the annual meeting, can be found in the Proxy Statement as originally filed with the SEC and made available to our stockholders on or about May 1, 2018. To the extent the information in the Supplement differs from, updates or conflicts with the information contained in the Proxy Statement, the information in the Supplement shall amend and supersede the information contained in the Proxy Statement. Except as so amended or superseded, all information set forth in the Proxy Statement remains unchanged and important for you to review. Accordingly, we urge you to read the Supplement carefully in its entirety together with the Proxy Statement. All capitalized terms used in the Supplement and not otherwise defined herein have the respective meanings given to them in the Proxy Statement. The Supplement is being made available to our stockholders on or about June , 2018. What is the purpose of the Supplement? We previously filed and made available to our stockholders our original Proxy Statement and related proxy materials on May 1, 2018, which contained three proposals. The enclosed Supplement is being sent to you because we have determined to (i) add a new Proposal 4 to the original Proxy Statement in order to approve the Amendment to our Amended and Restated Certificate of Incorporation, as amended, to increase the number of authorized shares of common stock from 33,333,333 to 60,000,000 shares, and (ii) postpone the 2018 annual meeting of stockholders, which was originally scheduled for June 14, 2018, to June 19, 2018, in order to provide additional time for stockholders to review the additional proposal and cast their vote. The record date for the annual meeting has not changed and remains April 20, 2018. How will the Supplement and proxy materials be delivered? Important Notice Regarding the Availability of Proxy Materials for the Stockholder Meeting to Be Held on Tuesday, June 19, 2018. How are votes counted for Proposal 4? The affirmative vote of the holders of a majority of the total outstanding shares of common stock will be required to approve Proposal 4. Abstentions from voting on the proposal and broker non-votes will not be counted as votes cast and accordingly will have the same effect as a negative vote on this proposal. The approval of this proposal is a routine matter on which a broker has discretionary authority to vote, and, accordingly, there may be few or no broker non-votes with respect to this proposal. How do I cast or revoke my proxy? Because this Supplement describes a new proposal to be voted on at the annual meeting that was not reflected or described in the original Proxy Statement, proxies submitted before the date of the Supplement will not include votes on the new proposal. 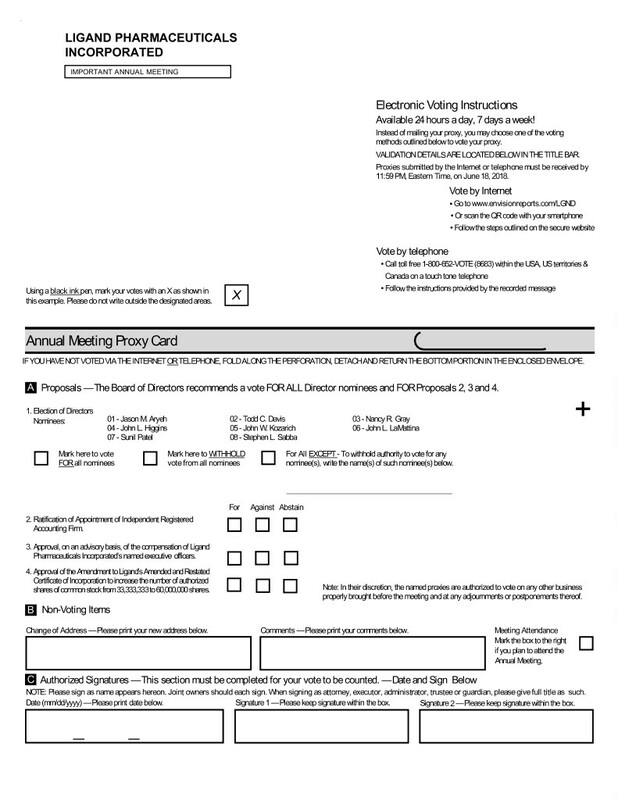 As a result, if you want to vote on the new proposal described in the Supplement, you must cast a new vote for the annual meeting by signing, dating and returning the enclosed proxy card (or by following the instructions to vote by Internet or telephone), or by voting in person at the annual meeting. Signing and submitting the new proxy card, or voting in person at the annual meeting, will revoke any prior proxy in its entirety. Therefore, if you submit the new proxy card (or vote by Internet or telephone), in addition to voting on Proposal 4, you must mark the new proxy card in the appropriate place (or follow the instructions to vote by Internet or telephone) to indicate your vote on Proposals 1, 2 and 3.
Who will bear the cost of this proxy solicitation? We will bear the entire cost of solicitation, including the preparation, assembly, printing and mailing of the original Proxy Statement and related proxy materials we filed on or about May 1, 2018, and the Supplement and related proxy materials, as well as any additional solicitation material furnished to stockholders. Copies of solicitation material have been or will be furnished to brokerage houses, fiduciaries and custodians holding shares in their names that are beneficially owned by others so that they may forward this solicitation material to such beneficial owners. In addition, we may reimburse such persons for their costs of forwarding the solicitation materials to such beneficial owners. We have retained Morrow Sodali LLC, a proxy solicitation firm, to solicit proxies in connection with the annual meeting at a cost of approximately $15,000, plus reimbursement of out-of-pocket expenses. The solicitation of proxies by mail may be supplemented by solicitation by telephone or other means by Morrow Sodali LLC, or by our directors, officers, employees or other agents we may engage for such purposes. No additional compensation will be paid to our directors, officers or employees for any such services. On May 21, 2018, our board of directors authorized and approved the Amendment to our Amended and Restated Certificate of Incorporation, as amended (“Certificate”), in order to increase the number of authorized shares of our common stock from 33,333,333 to 60,000,000. We are not proposing any change to the authorized number of shares of preferred stock. Under the Delaware General Corporation Law, we are required to obtain the affirmative vote of the holders of a majority of our outstanding shares of common stock in order to amend the Certificate to increase the number of shares of authorized common stock. Our board of directors determined that the Amendment is advisable and in the best interest of the Company and our stockholders, and recommends that our stockholders approve the Amendment. The Certificate currently authorizes the issuance of 33,333,333 shares of common stock and 5,000,000 shares of preferred stock, par value $0.001 per share. As of May 21, 2018, there were 21,319,647 shares of common stock issued and outstanding, and no shares of preferred stock issued and outstanding. In addition, as of May 21, 2018, we had an aggregate of 2,070,522 shares of common stock reserved for issuance upon vesting of stock awards and exercise of outstanding stock options granted under our 2002 Stock Incentive Plan, as amended, or our Amended 2002 Plan, 594,738 shares of common stock reserved for issuance pursuant to future grants under our Amended 2002 Plan, and 67,394 shares of common stock reserved for issuance under our Employee Stock Purchase Plan. In addition, as of May 21, 2018, an aggregate of 7,345,460 shares of our common stock are reserved for issuance upon exercise of outstanding warrant confirmations we entered into in connection with our 0.75% convertible senior notes due 2019 issued in August 2014. Our board of directors believes that the current number of authorized but unissued shares of common stock is not adequate to enable us, as the need may arise, to take advantage of market conditions and favorable opportunities involving the issuance of our common stock without the delay and expense associated with the holding of a special meeting of our stockholders. The availability of additional authorized shares will provide us with the flexibility in the future to issue shares of our common stock for general corporate purposes, such as acquisitions and other strategic transactions, raising additional capital, effecting stock splits, sales of stock or securities convertible into or exercisable for common stock, providing equity incentives to employees, officers and directors, and other general corporate purposes. Further, as described below, the lack of authorized shares of common stock impedes us from having the flexibility to elect to settle conversions of our outstanding 0.75% convertible senior notes due 2023 (the “Notes”) and the related warrants to purchase shares of our common stock (the “Warrants”) in shares of our common stock. We believe that the Amendment will provide us with additional flexibility to meet business and financing needs as and when they may arise. As of the date of this proxy statement supplement, we have no specific plans, agreements or commitments to issue any shares of common stock for which approval of the proposed Amendment is required, except as described herein, although we intend to continue to consider transactions from time to time that could result in such issuances. Our board of directors will determine whether, when and on what terms the issuance of shares of our common stock may be warranted in connection with any future actions. No further action or authorization by our stockholders will be necessary before issuance of the additional shares of our common stock authorized under the Amendment, except as may be required for a particular transaction by applicable law or regulatory agencies or by the rules of the Nasdaq Stock Market or any other stock market or exchange on which our common stock may then be listed. On May 22, 2018, we announced the closing of our offering of $750.0 million aggregate principal amount of the Notes. We have agreed to settle conversions solely in cash in respect of any conversion of Notes for which the relevant conversion date occurs prior to the first date on which our stockholders have approved an increase in the number of authorized but unissued shares of our common stock that are not reserved for other purposes, or we otherwise have a number of authorized but unissued shares of common stock that are not reserved for other purposes, in each case sufficient for us to issue and deliver shares of common stock upon conversion of all outstanding Notes. A maximum of 3,923,775 shares of common stock are initially issuable upon conversion of the Notes, based on the initial maximum conversion rate of 5.2317 shares per $1,000 principal amount of notes, subject to customary anti-dilution adjustments. Similarly, if at the time our obligations under the Warrants become due we have insufficient authorized shares to satisfy our obligations in common stock, we would be required to satisfy those obligations in cash as well. The strike price of the Warrants is initially $315.38 per share. The maximum number of shares of common stock issuable upon exercise of the Warrants is 4,527,450. Any newly authorized shares of common stock will be identical to the shares of common stock now authorized and outstanding. The Amendment will not alter the voting powers or relative rights of the common stock. the Amendment could adversely affect the ability of third parties to take us over or change our control by, for example, permitting issuances that would dilute the stock ownership of a person seeking to effect a change in the composition of our board of directors or contemplating a tender offer or other transaction for the combination of us with another company that our board of directors determines is not in our best interests or in the best interests of our stockholders. Our board of directors however, does not intend or view the Amendment as an anti-takeover measure, nor does it contemplate its use in this manner at any time in the foreseeable future. Neither the Delaware General Corporation Law, the Certificate, nor our Amended and Restated Bylaws provides for appraisal or other similar rights for dissenting stockholders in connection with this proposal. Accordingly, our stockholders will have no right to dissent and obtain payment for their shares. If the Amendment is approved by the stockholders at the annual meeting, it will become effective upon the filing of the Amendment with the Secretary of State of the State of Delaware. In accordance with the Delaware General Corporation Law, however, our board of directors may elect to abandon the Amendment without further action by the stockholders at any time prior to the effectiveness of the filing of the Amendment with the Secretary of State of the State of Delaware, notwithstanding stockholder approval of the Amendment. Our board of directors unanimously recommends that stockholders vote FOR the approval of the Amendment to the Company’s Amended and Restated Certificate of Incorporation, as amended, in order to increase the number of authorized shares of common stock from 33,333,333 to 60,000,000.